The first part begins with the wonderful, agile and vigorous “Sonata in C Major KV 19d” of Wolfgang Amadeus Mozart where the genius of Salzburgo shows his compositional talent in this work full of contrasts and nuances. This Sonata at first was written for a cembalo with two manuals was published in Paris in 1790. The concert continues with the Fantasie in f minor, one of the Schubert's most prominent piano duets. It dates from the beginning of 1828 and underwent publication by Diabelli, Vienna in March 1829. The work was dedicated to Countess Karoline Esterhazy de Galantha who was his pupil and is known too that Schubert was in love of her. The fantasie begins with an Allegro molto moderato where his bucolic theme will unify all the composition. In the last part the theme appears again now in fuga's form full of energy. The Fantasie D 940 is one of the last works of Franz Schubert who died at the age of 31. This performance offers one piece which rarely is listened in a concert. Manfred-Meditation composed by the philosopher Nietzsche. The second part starts with “La Petite Suite” of Claude Debussy wrote in the course of the year 1888. The work originally had five movements but at the end the composer withdrew the third. Debussy played the piece for the first time at a Parisian Salon on 1 March 1889 with Jacques Durand, the son of the publisher Auguste Durand, whom he had met at the Conservatory. Like all Debussy's early works, La Petite Suite which was published by Durand in February 1889, did not achieve success until after the composer had attracted attention with “Pelléas et Mélisande” Today along with the Arabesques La Petite Suite is among Debussy's most popular works. Although his role as a composer is practically unknown, Nietzsche has a very large catalogue of musical works. Manfred is a deep, intense and dramatic piece, a real struggle with oneself, a torrent of ideas that appears without resting while the main theme travel with us in this fantastic journey. The concert opens with a piece by Wolfgang Amadeus Mozart, the genius from Salzburg. A work of maturity of a young Mozart, where a 30 years old Mozart shows an image far from frivolity. The Fantasia D.940 by Franz Schubert for piano four hands is one Schubert’s last works. In fact, the composer died before this work was published. A work in four parts dedicated to Countess Karoline Esterhazy, who had been his pupil and of whom he was in love. After, two works of enormous depth, in which Debussy takes us to an atmosphere of dreams full of feelings. The second part starts with La Petite Suite by Claude Debussy. The work has four different movements. The first movement (En Bateau) describes the swell of the sea. The second movement (Cortège) recalls a festive parade. The third movement (Menuet) recreates an elfic atmosphere. The last movement (Ballet) is a festive movement, an Itlena dance full of energy. Then, there comes back a young Schubert with a work which recreates an atmosphere of melancholy which opens and closes this wonderful composition. The work of Abraham takes us to that age when the compositions were a kind of diary through which we could learn about the creative moment of the composer. Lyricism and nostalgia merge in this melancholic fantasy for piano four hands Op.1. A work full of shades and sounds absolutely romantic. After that, the radical and final contrast which closes this concert by the Tena Manrique brother and sister: the spectacular Franz Liszt Hungarian Rhapsody No.2, one of the most important compositions for piano four hands. The dances composed by Johannes Brahms and Antonin Dvorak play a highly prominent role in music history. These compositions have the magic powers to guide us to different places and different times. It has been said that if Brahms and Dvorak had only composed their famous Hungarian and Slavonic dances, respectively, they would anyway had made history like the great composers they are considered to be. Although some of these dances are better known for their orchestral versions, they were originally written for being played for 4 hands piano. To end the concert, we will listen to the impressive second Hungarian Rapsody by Franz Liszt. The reason why this work is one of the most outstanding compositions in music literature becomes apparent from the first notes. 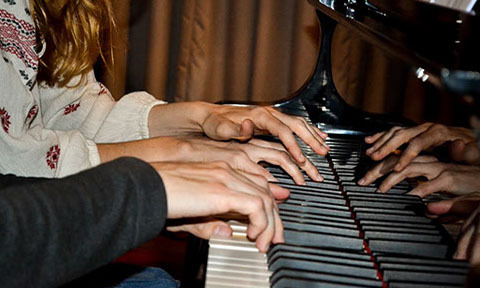 The interpretation of these works requires not only skill and a refined technique, but also, and most importantly, an understanding between the two players and an interpretative imagination that scares away not a few pianists. Wolfgang Amadeus Mozart also shows us in his piano creations for four hands why he is considered the genius from Salzburg, the prodigy of prodigies, the Great One amongst the Great Ones. His father Leopold Mozart encouraged him from the early stages of his life to compose music for four hand piano, in order to impress an audience little used by that time to listen to this type of compositions. 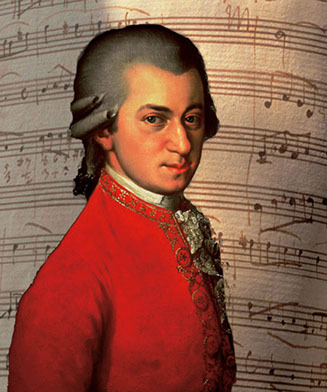 The result were a dozen wonderful pieces composed in different periods of Mozart’s life. Those were the works that set the basis from which much later Schubert, Schumann, Brahms and others would stem from. Without a doubt, 21st century audiences are as little used to this repertoire as they were in those 18th century decades. And just like it happened then, today’s audiences will be surprised and bewitched by the beauty that emerges from each sentence, each movement, each composition written by the Salzburg genius, Wolfgang Amadeus Mozart. 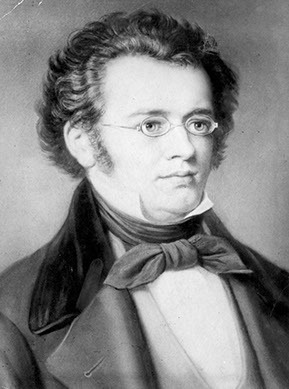 In his short life (31 years), The musician Franz Schubert composed more works for piano four hands than any other composer. Many of his works captured the interest of other Great composers, such as Franz Liszt, Nikolai Rimski Korsakov... who even orchestrated some of them. Between his first and last work, one can clearly see the evolution of a genius who died prematurely in 1828. Although it is true that, from his very first composition for piano four hands, one can apreciate the brilliance with which Schubert was able to surprise the world in all the genres in which he gave free rein to his creativity. Schubert’s work and his compositions for piano four hands must survive forever, since his compositions are the result of the creativiy of one of the greatest and most sensitive composer of all time.